100% natural and made from a nauturally ocurring paramagnetic igneous rock. When placed in your dog's water bowl these rocks will remove any nitrates and tin found naturally in water, giving your dog a cleaner, healthier source of water supply. Dimensions (in packaging): 2" x 3.3" x 9"
Oh my goodness! They work great! Now the grass is greener on my side of the fence!!! Dog Rocks are perfect! Wish I’d known about them sooner! Since the rise of the great American suburbs, a beautiful green lawn has been the mark of stability and character. Following its establishment in North America and Europe, the lawn appeared in Australia, where a naturally occurring paramagnetic igneous rock is also found. 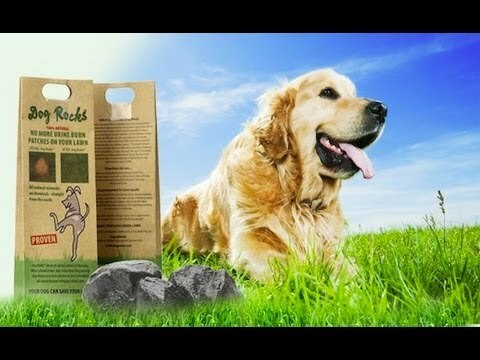 This igneous rock is used to make Dog Rocks, which has been helping families across UK and the rest of Europe—including most of the UK’s royal families—in keeping their lawns lush by preventing nasty yellow dog urine burn stains! 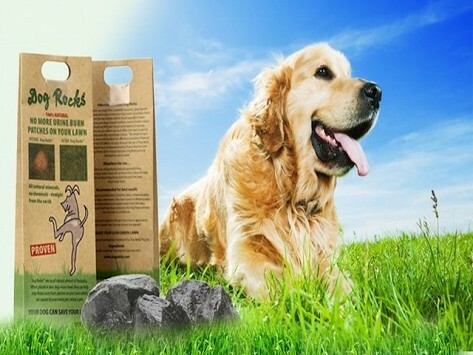 Dog Rocks are 100% natural and do not alter the pH urine balance of dogs in any way; they work by removing any nitrates and tin found naturally in water, thereby providing your dog with a cleaner, healthier source of water supply. Simply rinse the Dog Rocks, place in your dog’s water bowl and replace every two months. Soon, Sparky won’t ruin your uniform, green lawn anymore—and you’ll have admiring neighbors!